P.S. : I guess she wouldn't be called "Cinderella"
I guess she wouldn't be called "Cinderella"
Cheyenne decided today she'd do a "Mermaid Tale", and I thought I'd follow suit! I've always thought lion fish were crazy pretty. So... Alegaella (EDIT: Finderella) perhaps? And her fishy fairy godmother. So many people have joined in the fun! 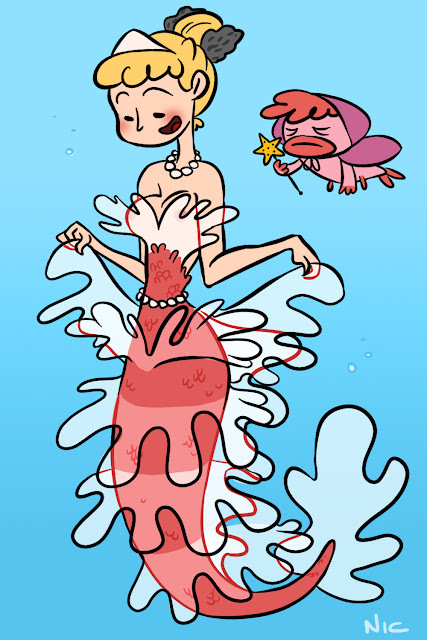 Check out #mermaidweek for our new players! So she would have a Glass Flipper? That is the best fairy godmother ever. this is awesome! I'll post my mermaid drawings soon!